A New York City reporter (Linda Kozlowski) learns of a tough Australian crocodile hunter by the name of Michael J. ‘Crocodile’ Dundee (Paul Hogan). Dundee’s legend has grown thanks to a recent encounter he had with a croc who nearly killed him, but miraculously he managed to survive the attack. He’s become an almost mythic folk hero to the locals. What a great story this will make to urban readers! She flies down under to meet him and get the scoop on this guy. Dundee takes her into the dangerous outback and she sees how this nature-loving tough guy lives. There’s a bit of an attraction between these two opposites and she convinces him to return to New York with her and experience the wilds of the big city for the very first time. Comedic culture clashes and a romance ignite. 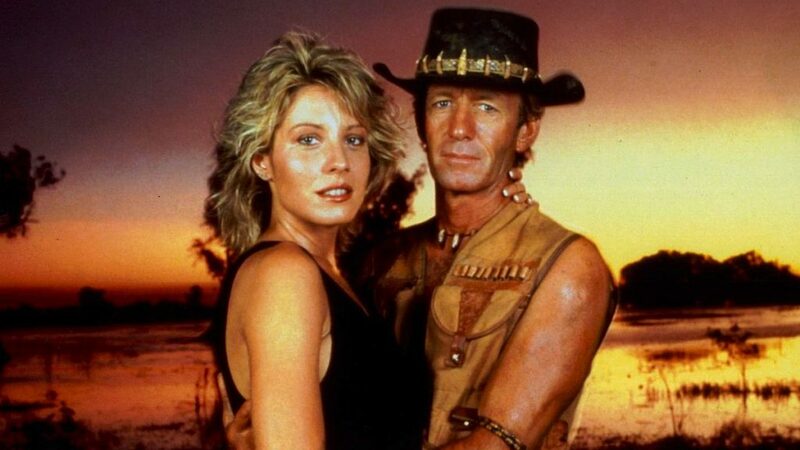 For those too young to have been around, you might not realize just what a huge hit ‘Crocodile’ Dundee was in 1986. The film seemed to come out of nowhere and ended up being the comedy of the year. It played steadily and remained at the top of the box office for weeks. It made a ton of money and instantly made Paul Hogan a star and his ‘Crocodile’ Dundee an iconic screen character, along with becoming the cinematic face of Australia. The film got critical recognition too! 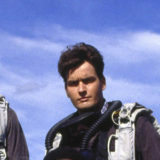 Hogan won a Golden Globe for his performance and Dundee got an Oscar nomination for Best Original Screenplay (it lost to Hannah and Her Sisters). From all the massive popularity, Hogan even ended up co-hosting the Oscar ceremony, alongside Chevy Chase and Goldie Hawn! It’s funny thinking back now to that year. 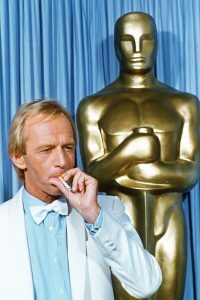 Today with all the careful selection, consideration and hype surrounding the election of an Oscar host and the vital important decisions that are placed on it, in 1987 they just hired the guy who starred in the most popular comedy of 1986 to be master of ceremonies. That’s unlikely to ever happen today. ‘Crocodile’ Dundee was really, really big! It was a huge surge of popularity and success for the at the time 46-year-old Hogan. He became and instant star, who only a short time earlier was only known to Americans as a spokesman in Australian tourism television ads with his famous phrase of throwing “another shrimp on the barbie for ya”. 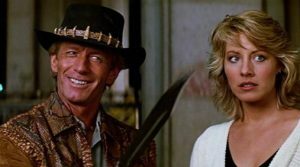 Directed in a very workman-like fashion by Peter Faiman, ‘Crocodile’ Dundee is a fun, amusing tale. There’s nothing particularly heavy or mind-blowing that occurs. You get a pretty clear idea of what’s going to go down based on its simple synopsis and it never tries to complicate it or reach for anything more. The movie keeps things light and even when the jokes aren’t all that great, Hogan’s charisma gets a smile out of you. He and Kozlowski have chemistry and it’s enough to carry a by-the-numbers love story to a satisfying end. So, Kowalski’s Sue Charlton gets a taste of the rough Australian life as she arrives in Walkabout Creek. She meets some colorful locals, gets introduced to Dundee and accompanies him into the Outback to see for herself about this croc attack and how Dundee managed to survive alone in the unforgiving terrain for two months. It’s not an easy setting and Sue herself faces a near fatal croc attack. Fortunately, Dundee comes to her rescue and sparks ignite between the two. It’s then Sue gets the idea of bringing Dundee back to NY with her. Dundee agrees. While he might be in full control in the barren terrain of the Outback killing snakes, skinning crocs and subduing water buffalo, he has no experience dealing with city life. It’ll be a challenge just facing a NY City escalator. Cue the classic image the film manages to milk for the rest of its runtime. There’s Dundee decked out in his croc-skin vest, hat and carrying his huge knife as a series of comedic encounters rain down on him. It’s so incredibly simple and might seem trite, but it works! Watching his confused innocent reactions to big city living becomes the movie. As I said some gags work better than others, but Hogan shines throughout. Arriving in NY, Dundee becomes an dumbfounded innocent, but still has his Aussie laid back charm, which endears him to the NY natives. I always thought it was funny the payoff to his ‘strolling through the city’ scene. The showy potion of him becoming overwhelmed by the crowds of people walking, trying to greet folks with his ‘G’day’ and him giving up jumping up on a sign post to catch a breath. The scene is a perfect compendium for the story. We saw it used in trailers and commercials all the time. But the quiet clincher to the gag is Dundee casually returning to his hotel on the back of police horse. The cop just hands him his knife back and wishes him well. We don’t see anything else of their encounter, but just know Dundee has charmed the cop and there’s no worries. There is that love story going on between Dundee and Sue. We all know as soon as these two first meet they’re ending up together. Sue is saddled with her materialistic, arrogant fiancé played by Mark Blum. We immediately don’t like him and are just waiting for Sue to dump this guy. The film doesn’t make it too difficult a choice for Sue. While rewatching it I was thinking how strange out is that Dundee has gotten pegged as a ‘family friendly’ comedy. There’s scenes with hookers, crossdressers, cocaine, muggers, street fights and plenty of drinking. I mean, it’s not exactly shocking stuff and it’s all played relatively quaint. In comparison to what comedies would do with scenes involving any of that stuff today, Dundee comes off G-rated! I have to mention the score by Peter Best. Dundee’s theme song is really cool! It gives an Australian vibe, helps add to the tension and the buildup to romance. Everytime I hear it it instantly takes me back to images of Hogan traversing NY and Koslowsi running after him to profess her love. 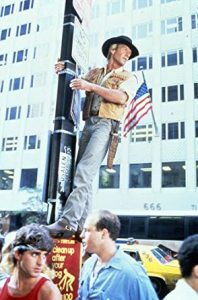 When I think about ‘Crocodile’ Dundee I always feel like it has remained a truly exclusive 1980’s film. It might have a bit of dust on it, but there’s no desire or attempts to clean it up and revitalize it. While other films and franchises from the 1980s have been rebooted, sequalized, re-adapted and dragged out countless times due to their long enduring appeal, Dundee seems to have been accepted as a fun comedy that had its time and can proudly rest right there. It’s fun to revisit, but there’s no desire to update it in it any way. Perhaps, that’s been helped by it having two subpar sequels. The extremely simplistic ‘fish out of water’ story that limits the story possibilities with the character. And the charm and liability of Hogan who WAS Dundee and was a big reason for the success of the film and character. Recasting a new Dundee would just seem wrong. Hogan made such an indelible mark with his character. This was reinforced to me, by that recent blowback when fans thought Danny McBride was stepping into the crocodile boots of Dundee, for what momentarily appeared to be a reboot. It turned out to be Super Bowl ad for Australian tourism, but boy, did people get upset about even the possibility of seeing a Dundee film that didn’t star Hogan. Did you see the live action Dora the Explorer movie trailer? They seem to be working from the Dundee template. An Evening Watching AMC’s The Walking Dead & Comic Book Men…..